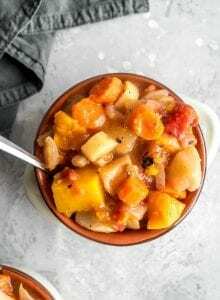 This hearty slow cooker root vegetable stew is perfect for chilly fall and winter days. It can be prepped in a few minutes then left to simmer in the slow cooker for 5 hours until the vegetables are melt-in-your-mouth tender. The flavour is savory with a hint of sweetness and the dish is low in fat and calories but full of flavour and nutrition. 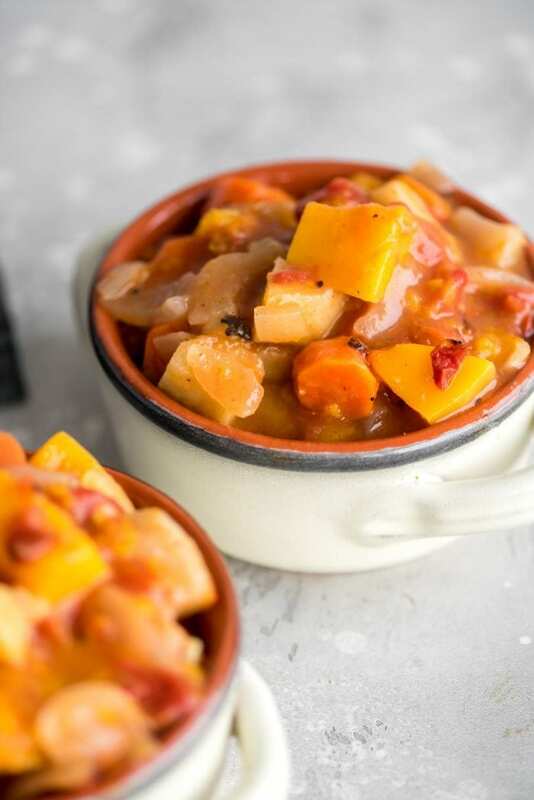 Get out your slow cooker and prep a batch of this stew for healthy comfort food all week! I’m all about cozy soups and stews lately. I’ve been making soup after soup and I think it just got chilly enough to start in on the stews. During the warmer months, my food prep routine typically consists of salads but as the temperature drops, food prep goes from raw to cooked and my oven, stovetop and slow cooker get put to work. I crave warming foods during the colder months and tend to lean toward root vegetables over leafy greens. I still try to sneak in some raw, leafy green salads but my body really craves roasted vegetables such as carrots, squash, onions, leeks, cauliflower, beets and parsnips. 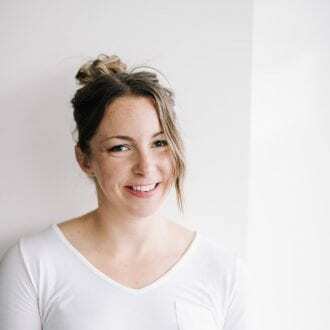 In traditional Chinese medicine, certain foods affect our body temperature by heating and invigorating from the inside out. Warming foods are thought to dispel the cold, improve circulation and replenish the energy of the organs, all of which is greatly needed, particularly in cold winters. Butternut squash isn’t actually a root vegetable but parsnips, carrots and rutabaga are. Root vegetables are some of the most nutrient-dense foods in the world. They each have their own set healthy benefits but they also share some common ground, so to speak. 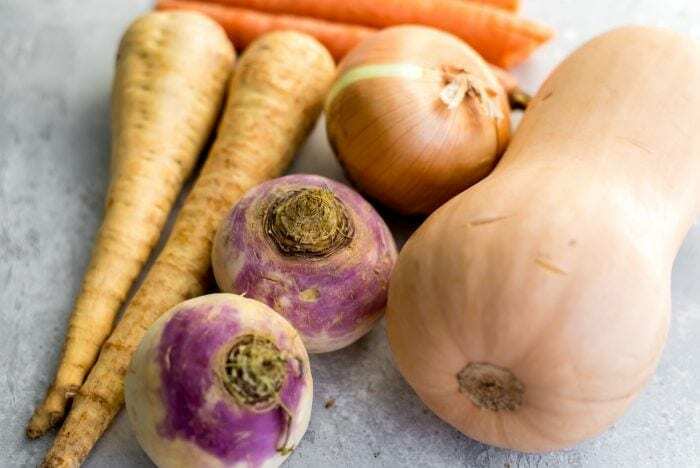 Root vegetables are all high in antioxidants, vitamin C, B, A and iron and high in fiber with healthy carbohydrates making them a great source of energy. The benefit for cooking this in a slow cooker is not having to worry about it for around 5-6 hours, plus giving it extra time for the flavours to come together and vegetables to cook to tender perfection. However, you can also make it on the stovetop. I’d probably let it slightly simmer for about 45 minutes to an hour until everything is soft. Once it’s cooked, stir in the cornstarch or flour mixture, remove from heat and let it thicken up. Either way it will be delicious. I prefer the slow cooker method for this dish though. This stew is savory, hearty and comforting with a hint of sweetness. It’s absolutely perfect after a long day, especially a cold one! It’s can be made ahead and kept in the fridge for up to 5 days, it can be frozen and it makes a great packed, plant-based lunch too. The vegetables are cooked until perfectly soft and ready to melt-in-your-mouth with every bite. Best part? It’s so easy to make: just a few minutes of chopping, toss it all in the slow cooker and dinner will be ready in a few hours. I love the flavour of the slightly sweet butternut squash and parsnips with the carrots, rutabaga, onion and garlic. 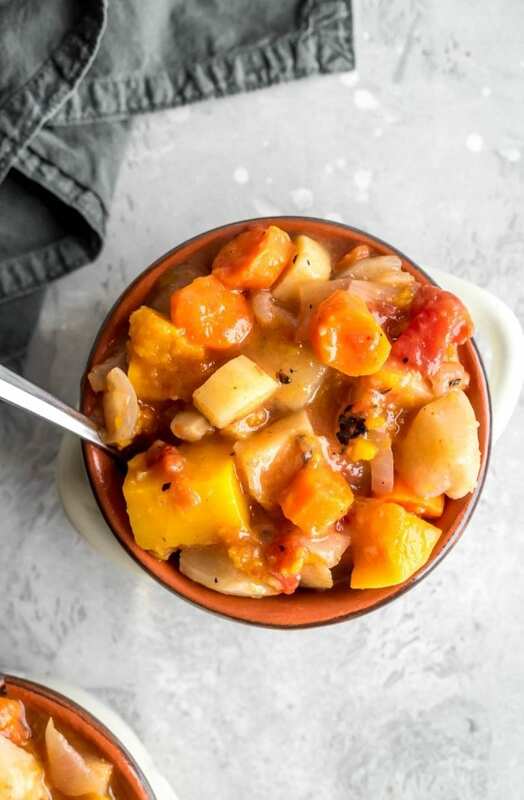 This hearty, filling stew is easy to make in a slow cooker with any combination of root vegetables. Use 12 cups total cubed veggies to customize to your liking. This stew is great for meal prep as the flavors only improve the next day. Freezes well too! Add all ingredients except for the cornstarch/flour to a slow cooker and give it a good stir to mix thoroughly. Cook for approximately 3-4 hours on high and 4-6 hours on low. When there’s about an hour left, combine the cornstarch or flour with a little water in a small bowl to form a paste then stir into the stew. Let simmer lightly on low for another hour or so. There’s no real set time for this, once the vegetables are soft and tender and it’s thickened up, it’s ready! Season with salt and pepper and serve right away or store in the fridge up to 5 days or freezer up to 3 months. 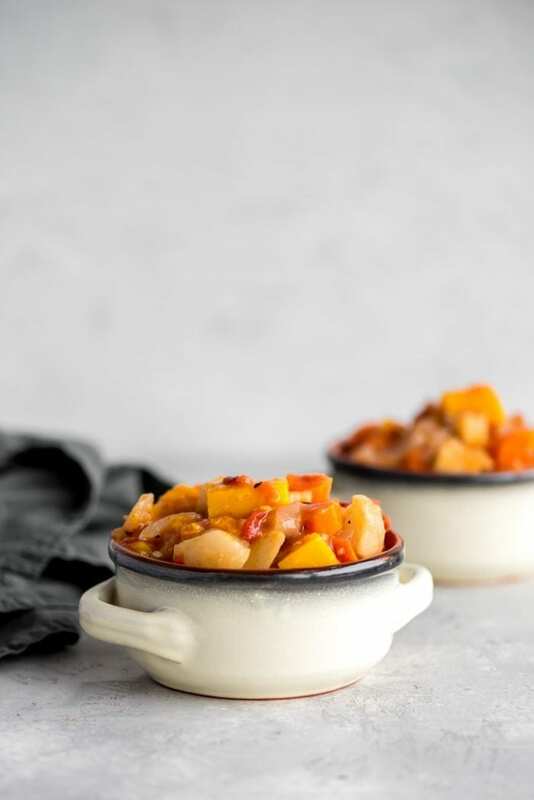 For the vegetables, you can use up to 12 cups of any combination the following: butternut squash, acorn squash, sweet potato or yam, potato (any variety), turnip, rutabaga, carrot. This makes 5 large meal-sized servings of about 500 grams each. It could serve 6-7 in smaller portions but since it’s so low calorie, I like a large serving of this. Alternatively, you can mix in up to 2 cups of cooked lentils for a more substantial meal. This looks so hearty and comforting! It’s starting to get colder here so this will be perfect to make on a chilly night. Yum! Made this several times..I use a pressure cooker so ot only takes 4 min! LOVE it! Any idea on macros? This looks so good! I love slow cooker recipes. Thanks! Is 1 cup rally enough liquid?? I just made this tonight! 1 cup was plenty, just remember to include the juice from the diced tomatoes ???? Right, of course. I couldn’t remember about the 1 cup but now recall that the juice from the tomatoes makes it enough liquid! Thanks! I love vegetables. The best thing about your recipe is that you have put together so many colorful vegetables and made the dish look so delicious. I’ll have to try it very soon. So, maybe I did something wrong, but mine has a sweet flavor, followed by a slightly bitter flavor. What can I do to fix this? Hmm, I’m not sure, did you follow the recipe exactly as written? It could be the parsnips..they have a very distinct flavour, have you had them before?